A touch of whimsy with a little sparkle... Add some wire and it all comes together! Hi, Welcome to Cobalt & Copper, my name is Cova; I was a jewelry artist that worked strictly with beads until I discovered wire-wrapping and found my passion, wire just speaks to me and I love what I do. 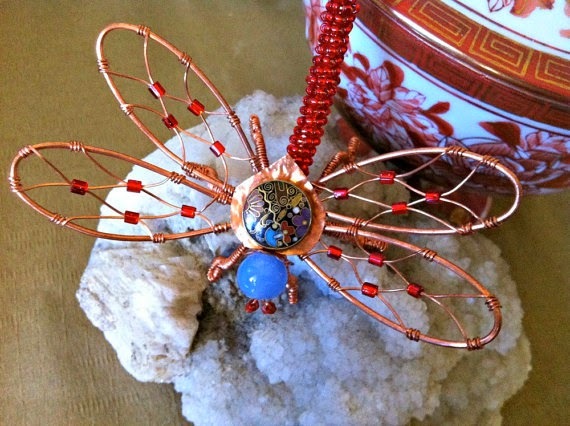 The Dragonfly is what started it all, I saw a dragonfly in a magazine and just had to make one, after weeks of experimentation, what I ended up with was a Dragonfly made of beads and copper wire. After giving them as gifts to all my friends and family, they encouraged me to try and sell them... Dragonflies are still my signature piece and one of my favorite things to make. Most of my designs are largely inspired by the beauty, shapes, colors and textures found in nature. I use up-cycled materials whenever I can, I love that a bit of Sea Glass, a Discontinued Fabric Sample, Vintage Bead, Button or a left over Stained Glass Scrap makes each piece unique and one of a kind.